MTN just advertised their YouTube plan once again on their social media pages. MTN YouTube video streaming bundle will allow you stream YouTube videos of your choice for some couple of hours. You can now subscribe for MTN YouTube video streaming pack via SMS. This plan is for those who loves watching YouTube videos. You guys will really find this interesting. MTN YouTube Video streaming pack is a time-based data plan that allows you watch videos on YouTube from your phone. You can subscribe to any YouTube Video Streaming Pack via SMS by texting the plan specific keyword to 131. 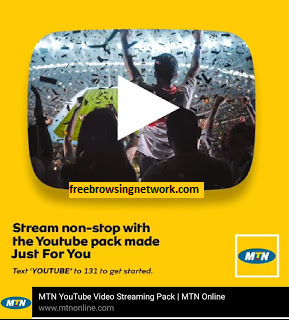 Comment on "How To Subscribe To MTN Free YouTube Video Streaming Pack"